TRUCK-ER-TREAT: A Halloween Photo Contest!!! TRUCK-ER-TREAT: A Halloween Photo Contest! Click here or on the image below to get more info! TRUCK-ER-TREAT! A Halloween Photo Contest aimed at truckers! Attention Truckers: We want to see your Trucking themed Halloween photos! 1) “Like” PEOPLEASE on Facebook then post your picture to our wall with the hashtag #truckertreat! 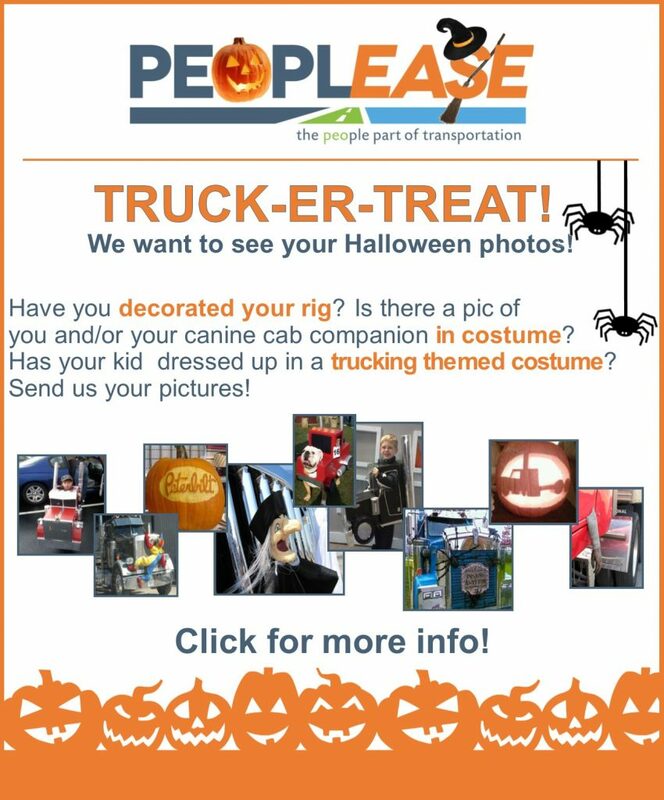 2) Follow us on Twitter @PEOPLEASE and post your picture using the hashtag #truckertreat! 3) Email your images to PEOPLEASE by responding to this message or sending pictures to info@peoplease.com. Note: In order to be included, all photos must be submitted by contestants in one or more of the three ways listed above by 11:59 pm on Wednesday, November 2nd. Don’t forget to send your trucking travel pictures year-round to be featured on PEOPLEASE’s social media pages! The top three trucker winners will receive a goody bag! PEOPLEASE’s Community Committee along with our Executive Leadership Team will be voting on and selecting the winners. The announcement will be made after all winners have been contacted to obtain a mailing address to ship the prize.